Arianespace have launched with Yahsat 1A and Intelsat New Dawn telecommunications satellites via the Ariane 5 ECA launch vehicle on Friday, the same vehicle which suffered a rare pad abort after main engine ignition on its first attempt at the end of March. After the vehicle was rolled back at the the European Spaceport in Kourou, French Guiana – engineers resolved the problems – and successfully say the Ariane 5 launch at the start of the launch window at 21:37 GMT. Originally scheduled for liftoff on March 30, this dual-payload mission was delayed following an interruption of the final countdown when an incorrect displacement of one of the Vulcain 2 engine’s actuators was detected. The Ariane 5 was transferred back to the Spaceport’s Final Assembly Building on April 1, where the actuator was replaced and the launch vehicle was returned to its flight configuration. Following a successful review, Ariane 5 was cleared for rollout from the Final Assembly Building to the ELA-3 launch zone, where it will be readied for liftoff on Friday during a launch window that opens at 6:37 p.m. local time in French Guiana and continues to 7:41 p.m. The Ariane reached its 200 flight milestone via the launch of the Automated Transfer Vehicle (ATV-2) – the opening launch of the year, via the Ariane 5 ES launcher – with the cargo vehicle currently docked to the International Space Station (ISS). The Ariane 5 ECA (Cryogenic Evolution type A) – the most powerful version in the Ariane 5 range – is being used for this flight. 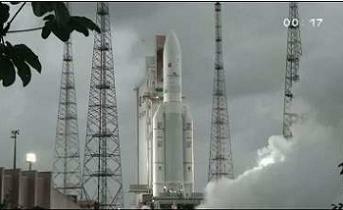 The Ariane 5 ECA is an improved Ariane 5 Generic launcher. Although it has the same general architecture, a number of major changes were made to the basic structure of the Ariane 5 Generic version to increase thrust and enable it to carry heavier payloads into orbit. During the initial countdown on March 30, all was green through to main engine ingition, with the Vulcain main engine igniting and ramping up to full power – as designed. However, instead of the twin solid rocket boosters then firing to launch the vehicle, some seven seconds later, the vehicle remained on the pad, with the main engine still firing for what appears to be at least another ten seconds. With the vehicle in a pad abort stance, safing was undertaken, with both the vehicle and its passengers secured. 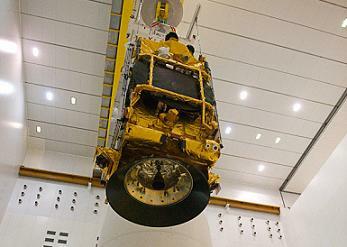 The launch was delayed to April 22, due to the need to rollback the vehicle to its integration center for investigations and reconfiguration – given the umbilicals were all released during the pad abort. The 57th launch of an Ariane 5 – designated as VA201 – will carry a total lift performance of nearly 10,065 kg, which includes the combined 8,965 kg liftoff mass of the two spacecraft passengers, along with the SYLDA dual payload dispenser and integration hardware. 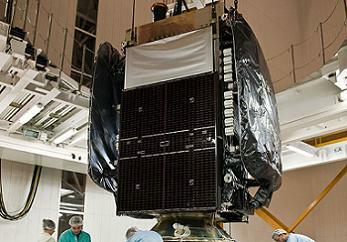 With a liftoff mass of 6,000 kg, the Yahsat Y1A spacecraft is based on Astrium’s Eurostar E3000 platform. Yahsat Y1A is the initial telecommunications relay spacecraft for Al Yah Satellite Communications Company (Yahsat), and it was built by an industrial team of EADS Astrium and Thales Alenia Space – which have the responsibility of co-prime contractors. Astrium is the lead for a turnkey delivery of the two-satellite Yahsat system, while Thales Alenia Space is in charge of the launcher procurement. With a payload of Ku-, Ka- and C-band transponders, the spacecraft will provide coverage over the Middle East, Africa, Europe and Southwest Asia. Intelsat New Dawn is the first-ever African private sector communications satellite, with the mission of supplying critical communications infrastructure for African customers. To be marketed and operated as part of the Intelsat satellite fleet, Intelsat New Dawn will deliver wireless backhaul, broadband and media content – which are the fastest growing satellite-based applications in Africa. Produced by Orbital Sciences Corporation in Dulles, Virginia, the relay platform carries C-band and Ku-band transponders, and will have a liftoff mass of 3,000 kg. After its deployment by Ariane 5, it will be positioned at a geostationary orbital slot at 32.8 degrees East for its Africa area coverage. The latest Ariane flight will keep up the mission pace for Arianespace during the year, in which the company is targeting a total of 12 launches – composed of six Ariane 5 flights, the first two Soyuz launches and Vega’s inaugural liftoff, all from the Spaceport; along with three Soyuz launches from Baikonur Cosmodrome in Kazakhstan. At the Spaceport, another Ariane 5 mission is also taking shape for a May mission with the ST-2 and GSAT-8 satellites – with initial assembly completed. The Spaceport is designed for such parallel mission operations, enabling two Ariane 5s to be prepared for flight.